We will now turn our steps to Glendalough, or, the Valley of the Two Lakes, a spot which, if it offer fewer natural beauties to the observer of nature than other portions of the county of Wicklow, is possessed of more than common interest to the lover of Irish antiquities. It is about half-a-mile west of the bridge and village of Laragh, where the mountain streams which pour from the various lakes and ravines in the district unite under the name of the Avonmore, and flow in a south-easterly direction, through the beautiful Vale of Clara, until they mingle with the waters of the Avonbeg in the Vale of Avoca, from whence they roll into the sea a few miles further down at Arklow. The valley of Glendalough, or, as it is frequently called, The Seven Churches, is twenty-eight miles distant from Dublin, and thirteen from Wicklow. It is about two miles and a half in extent, open at the eastern extremity, but enclosed on every other side by lofty and precipitous mountains. Ascending the valley through which the road winds for nearly a mile and a half, we obtain the first view of the once celebrated GLENDALOUGH, the site of the "mountain city," where religion and literature flourished in former times, but which now presents to the curious traveller nought save a melancholy waste, whose sombre character is deepened by the mouldering relics of past greatness that lie scattered through the glen. On an eminence that slopes gently down from the mountain towards the lake, the principal ruins of Glendalough form an exceedingly picturesque group. The first object that attracts our attention is the stately Round Tower (one of the finest in the kingdom), in the vicinity of which are seen the Cathedral,—Our Lady's Church,—a stone-roofed building, with its singular belfry-tower, called Kevin's Kitchen,—at a little distance, in the bottom of the vale, the remains of the venerable Abbey,—and beyond these the still waters of the lake, thrown into solemn shade by the precipitous and gloomy mountains which overhang them, and form here a world of their own—dark, silent, and motionless as the grave. 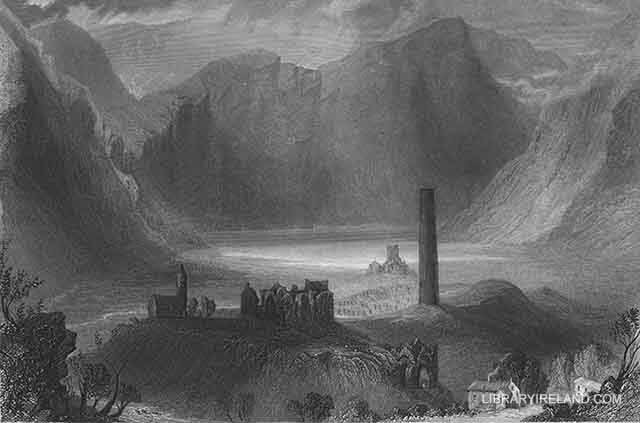 "There is nothing in these buildings particularly interesting," says Mr. Otway, in his entertaining Sketches, "except their extraordinary position in the midst of the lonely mountains, placed at the entrance of a glen, singularly deep and secluded, with its two dark lakes lying in gloom and solitariness, and over which deep vale hang mountains of the most abrupt forms, in whose every fissure and gorge there is a wild and romantic clothing of oak, birch, and holly." It is indeed, a region where the wild, solitary enthusiast might conjure up visions of things that mortal eye had ne'er beheld; a dim valley over which the Angel of Death seems to have spread the shadow of his dark wings; a tomb where every human passion is buried, and within whose gloomy precincts the sombre goddess, Melancholy, walks in lonely meditation wrapt. To this dreary solitude did St. Coemgan, or Kevin (a holy man who flourished in the fifth century), retire after he had assumed the cowl; there he wrote many learned works, and founded the Abbey of Glendalough, over which he presided as abbot and bishop for many years, dying in the odour of sanctity on the 3rd of June, 618, at the great age of one hundred and twenty years. His extraordinary piety and virtue, no less than the numerous miracles wrought by him, drew, as the Monasticon Hibernicum informs us, "multitudes from towns and cities, from ease and affluence, from the cares and avocations of civil life, and from the comforts and joys of society, to be spectators of his pious acts and sharers in his merits, and with him to encounter every severity of climate and condition. This influence extended even to Britain, and induced St. Mochuorog to convey himself hither; who fixed his residence in a cell on the east side of Glendalough, where a city soon sprang up, and a seminary was founded, from whence were sent forth many saints and exemplary men, whose sanctity and learning diffused around the western world that universal light of letters and religion which, in the earlier ages, shone so resplendent throughout this remote, and at that time tranquil isle, and were almost exclusively confined to it." Such is the brief history of the foundation of the ecclesiastical city that once adorned these mountain solitudes, but of which the decaying ruins are all that now remain. 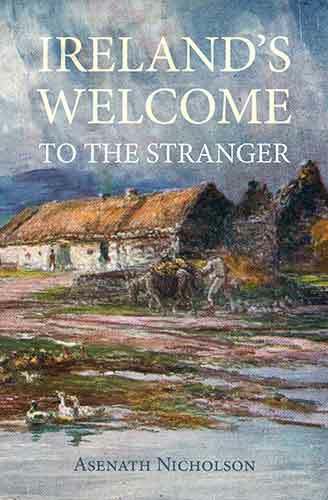 Even the identity of the Seven Churches, for which this valley has been, for centuries celebrated, and which at the present time confer a second name upon the spot, cannot be exactly ascertained; and of the famous city of Glendalough, built by St. Mochuorog, not a vestige remains except a small paved plot of ground, of a quadrangular form, which indicates the site of the market-place of the fallen city. No traces of domestic buildings have been discovered; but the remains of a causeway, extending from the ancient market-place to Hollywood, on the borders of the county of Kildare, are still visible. This laborious work of art was about twelve feet in width, and was composed of blocks of roughly-hewn stone set edgewise, not unlike the Roman roads that are frequently met with in England.